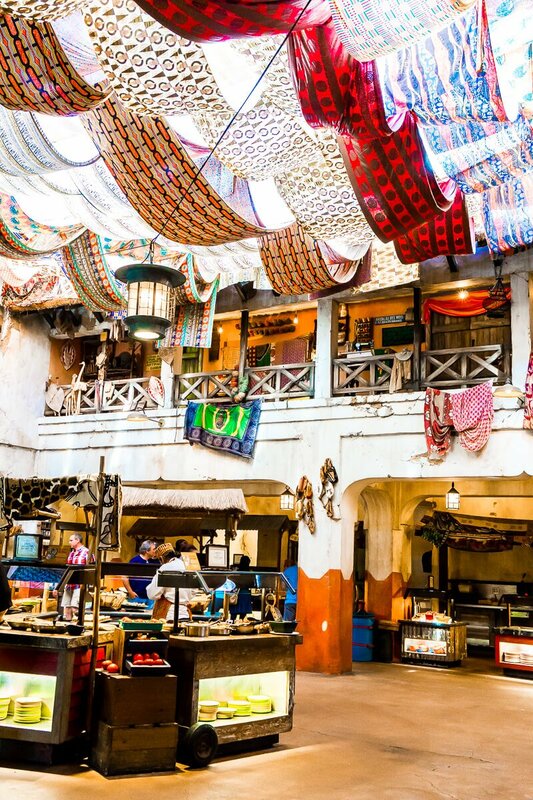 Don’t skip the Disney character dining during your next trip to Walt Disney World! 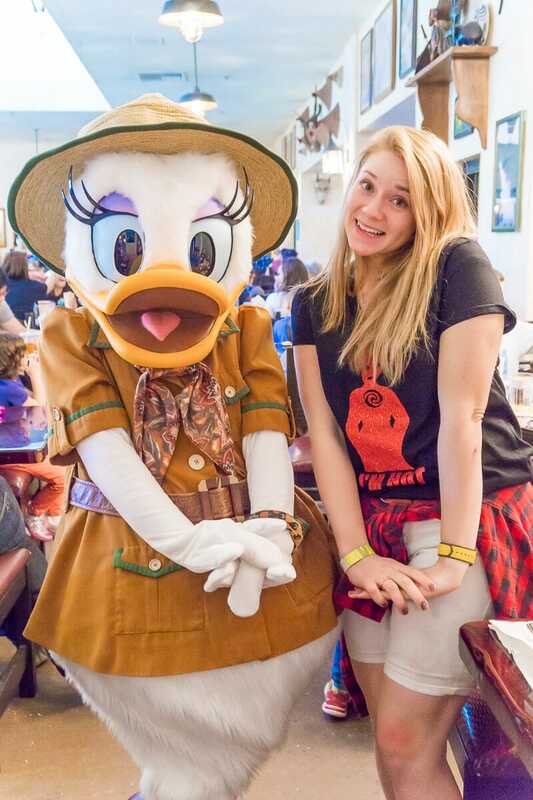 You never know, a Disney character breakfast may just be the most magical moment of your entire trip! 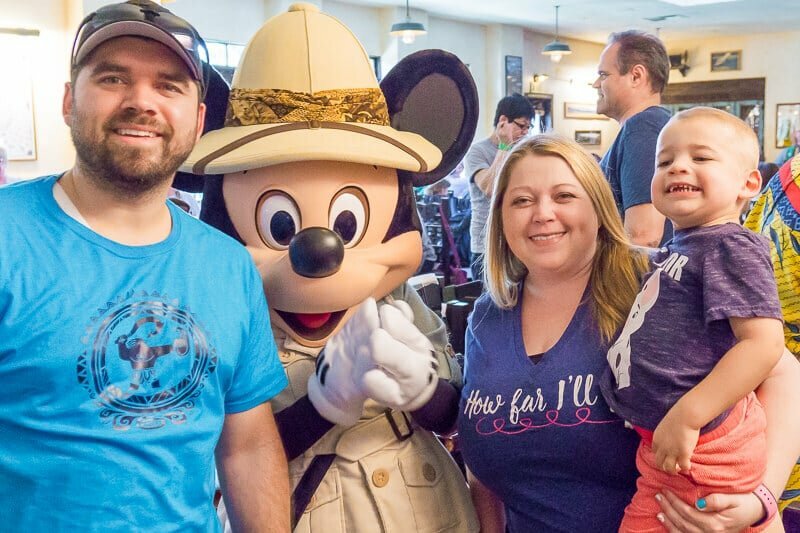 Use these tips to determine the best character dining at Disney World for your family, where to find the best Disney characters, and more! 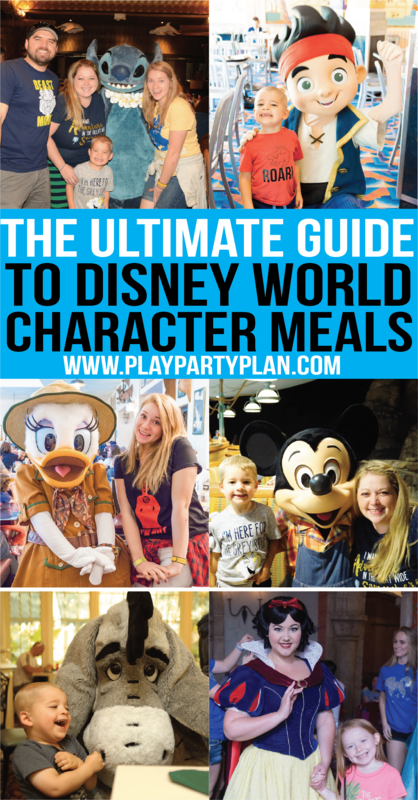 Tons of great tips for Disney character meals including great ideas for dining with young kids! Over the past year my family has been to Walt Disney World four times. And on each trip, we’ve done at least one fun Disney character dining experience. Those Disney character meals have been some of my favorite Disney vacation moments ever, so I highly recommend them to anyone and everyone! Before I get started, let me caveat this post by saying that I’m writing this post focused solely on the Disney character dining, not on you wanting to get on Frozen Ever After first thing in the morning or you wanting to see fireworks. This is solely my opinion about Disney character dining, regardless of your other park or viewing plans. We go to Disney often enough that we tend to base our plans on Disney character meals we’ve scheduled rather than planning our meals around our activities. We’ve done quite a few Disney character meals over the past few years, and I hope to try them all out at some point. I’ve put together a guide to all of the character meals that we’ve tried and included links to other reviews from my friends for the meals we haven’t done! Below the Disney character dining descriptions is an entire section on doing Disney character meals with young kids because that’s a beast of its own! 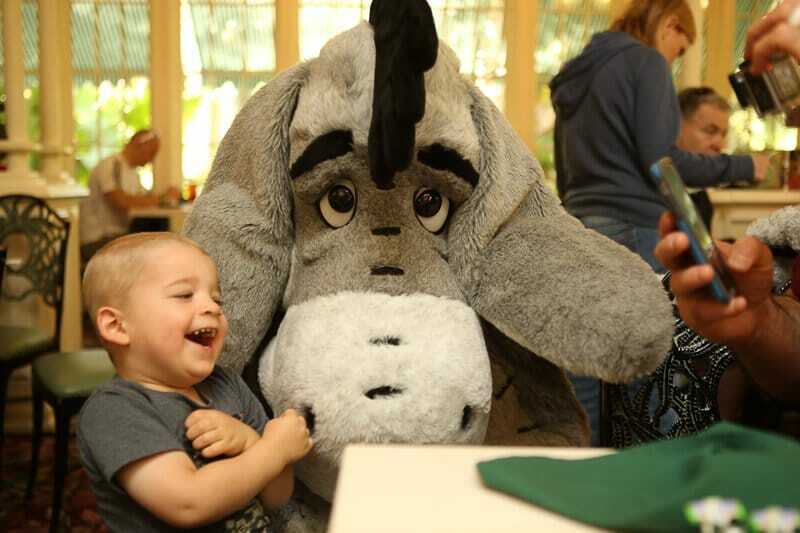 If your kids like Winnie the Pooh, this is my all-time favorite character dining experience because the characters are just magical. Unlike some of the other places where the characters seem rushed and too scheduled, the Winnie the Pooh characters played with my son, jumped with him, and really spent time interacting with him. It wasn’t just a character meet, it was a character experience. The food is served buffet style and pretty decent, not the same caliber as say Tusker House, but good enough. You’re not coming for the food. There are also good kid options like the infamous mini corn dog nuggets, mac & cheese, and more. 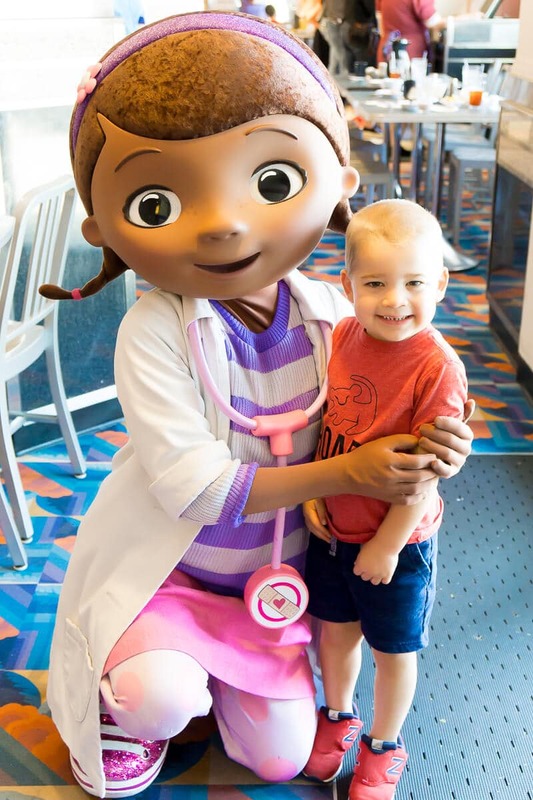 The reason we loved this one was because it’s the only character dining that includes Disney Junior characters – Jake, Sofia, Doc, and Handy Manny. 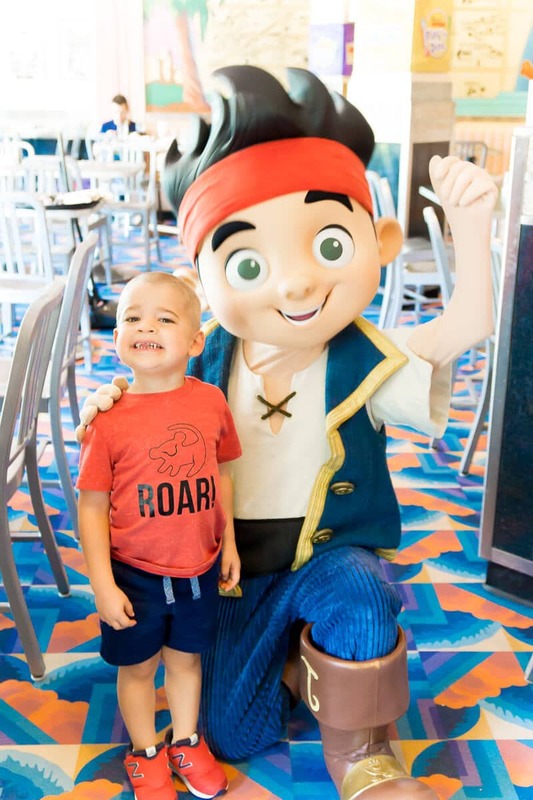 My son watches Disney Junior all the time and loved seeing some of his favorite characters come to life. I mentioned it above but if you can get a reservation at the magical 10:30 time, you’ll likely get to try both breakfast and lunch and may even get lucky enough to see the characters multiple times like we did. 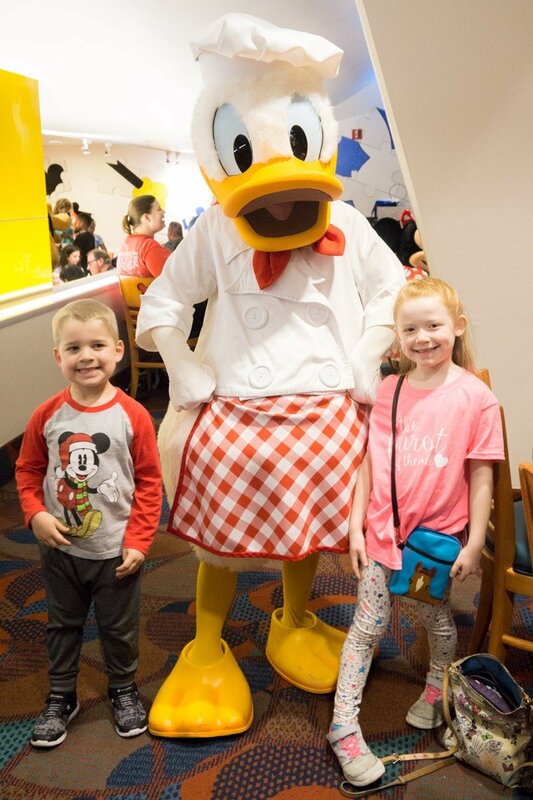 Just be aware that beginning in May, they are discontinuing the Disney Junior Play and Dine at lunchtime, so there may be some changes coming. 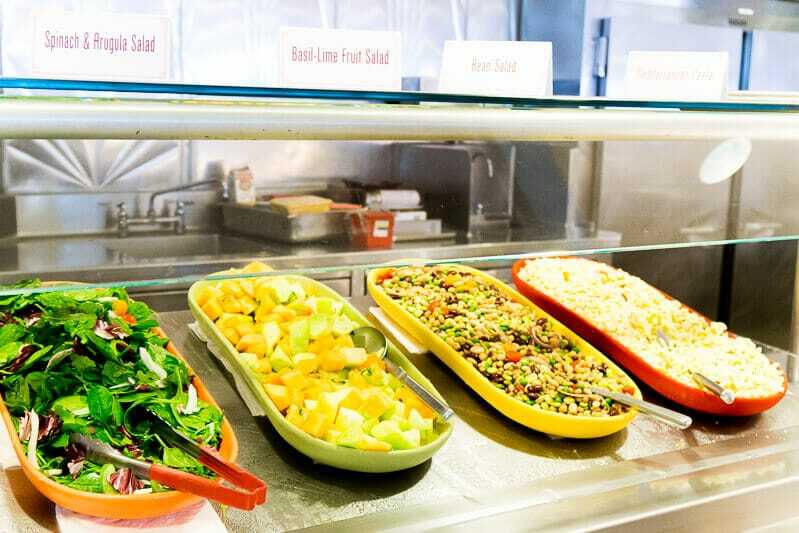 The food here was similar to Crystal Palace, pretty standard buffet fare with some healthy and unique options like an arugula salad mixed in. At lunch and dinnertime, Hollywood & Vine turns into a Minnie & Friends character meal instead. The characters were good, but like I mentioned above, this was one of the places that felt a bit rushed and squished. 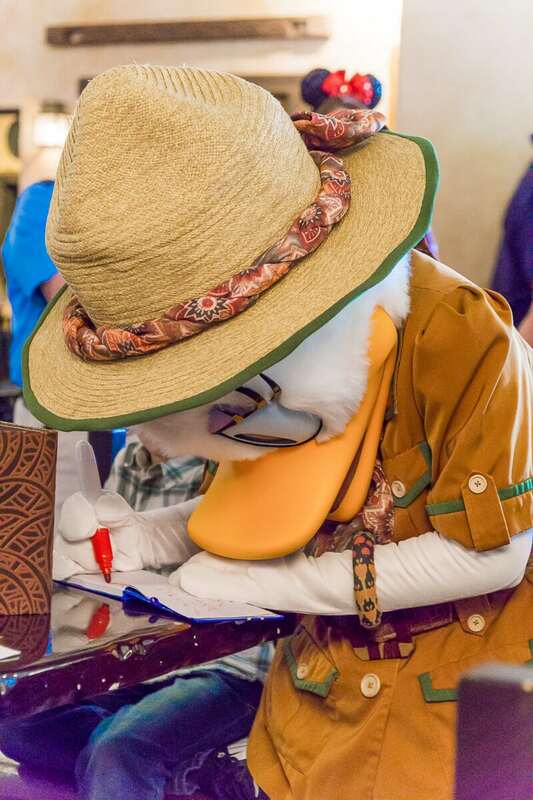 The characters include Donald, Daisy, Mickey, and Goofy all dressed up in safari gear, which is a fun change from their normal outfits. 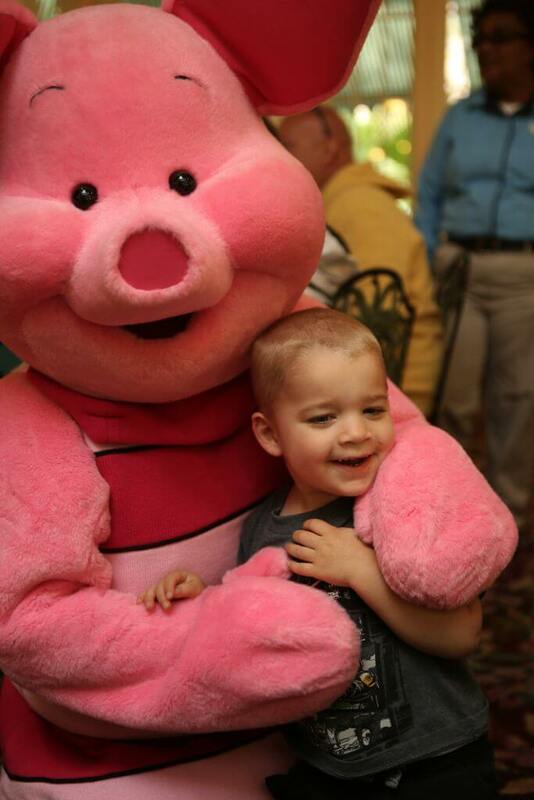 You’ll get time with each of the characters, just long enough for a quick hug and photo. The big winner here was the food and the location in the middle of Animal Kingdom. We went at 10:45 in that magical breakfast becomes lunch hour and enjoyed everything from donuts and smoked salmon for breakfast (that’s all my sister ate) to meats and a ton of African inspired dishes for lunch. 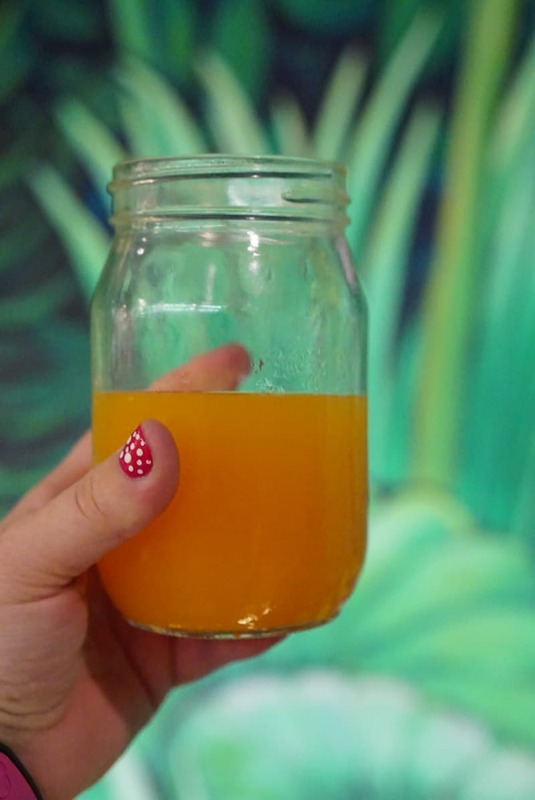 Oh and don’t forget to try both the breakfast speciality juice (kind of a tropical guava mix) and the pomegranate lemonade at lunch! This character breakfast is outside of the parks in The Polynesian Resort. We enjoyed a leisurely Ohana breakfast with Mickey, Pluto, Lilo, and Stitch then hopped on the monorail over to Magic Kingdom. If you’re not in a hurry to get into the parks, it’s a great way to skip the craziness at the Transportation & Ticketing Center all together. The character experience here is similar to Tusker House where it feels a bit rushed but the interactions were still great, albeit short. 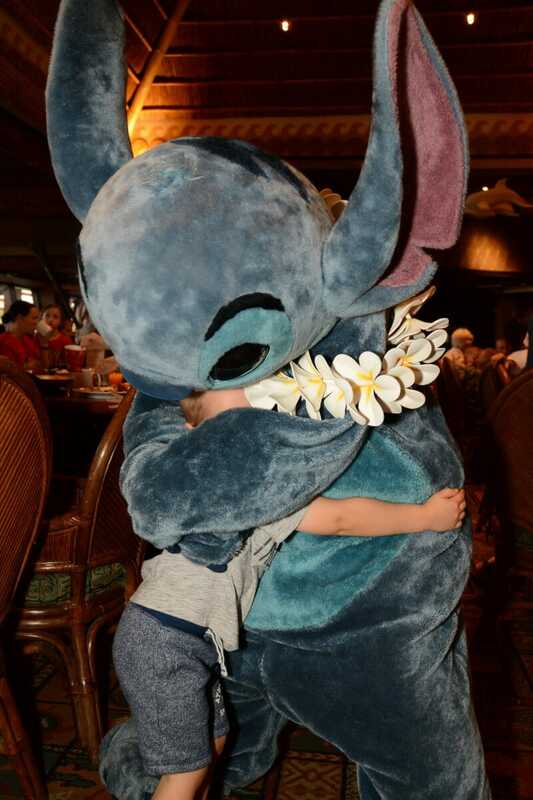 And my son’s interaction with Stitch was one of the highlights of the trip. 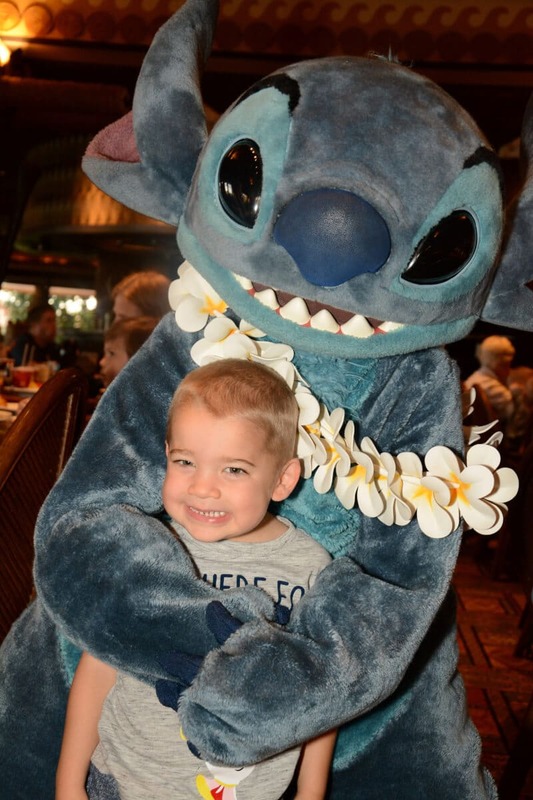 Unlike most character dining experiences, Stitch travels with a professional photographer so if you have the Memory Maker pass, you can get those professional photos uploaded to your account for free. Ohana means family and that’s what this character meal is all about. Instead of ordering individual meals or picking things off a buffet, the food here is served family style. 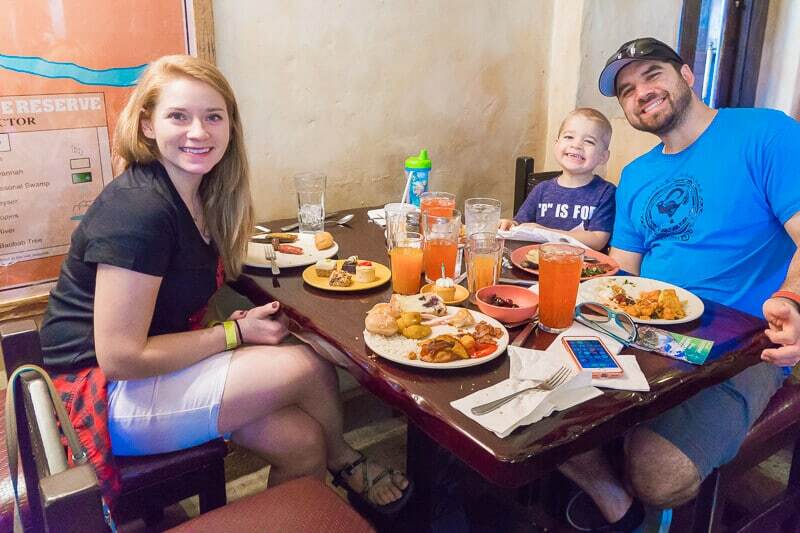 Cousins (cast members who work at The Polynesian) bring out fruit, an incredible Hawaiian sweet bread, drinks, and a huge platter of standard breakfast fare like scrambled eggs, bacon, biscuits, sausage, potatoes, and the all important Mickey waffles for the family to share. Want more of something, just ask. It’s an all-you-can-eat affair. Want more of just one thing? Just ask. The cousins were wonderful and brought us everything we needed, including some extra crispy bacon for my super picky toddler. I won’t go into too many details here because I already wrote an entire post about eating at Beauty and the Beast with young kids. I will say though this was probably the only meal with characters (because it’s not really a character meal) that we’ve done that wasn’t worth the price. The food was decent but not our favorite and the Beast was a bit scary for our 3-year-old. But if you have a Beauty and the Beast lover, it’s definitely worth a shot. Make these fun DIY Beauty and the Beast shirts for great photo opps! This is one of my favorite character dining experiences because it’s one of the only places where you can see all five of the Fab 5! They all come around dressed in their chef’s best, and it’s just a really fun restaurant. Since it’s in the Contemporary resort and not in a park, it’s one of my favorite places to do dinner the night before our Walt Disney World vacation begins! The food is setup buffet style and just okay but there are normally plenty of options, both for kids and adults. And the dessert buffet options are amazing! We had macarons, mini cheesecakes, cupcakes, ice cream, and more. It’s also a fun location because the monorail actually goes through the hotel, and you can watch as it goes by! One of the best things about this character meal is that unlike many of the others, it’s pretty easy to get a table. There are actually a lot of good things about this meal, but that’s a huge one. When you can’t get a character meal anywhere else, you can typically get a table here. The other cool thing is that the restaurant actually rotates, like the tables rotate around so the restaurant itself almost feels interactive. During the meal, you’ll get to meet Mickey, Chip, Dale, and Pluto all dressed up in farmer gear. The one complaint I had about the meetings were that the space is a bit squished, especially if people need to get by at ant point. But other wise, this is a really fun one! The food is also pretty good. 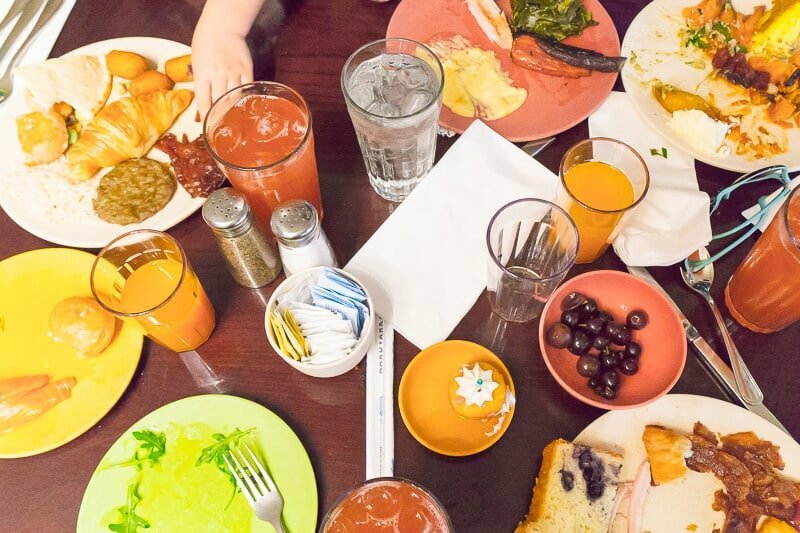 During breakfast, you get family style breakfast food including scrambled eggs, a sticky bun bake (so good), fresh fruit, sausages, bacon, and of course Mickey waffles. 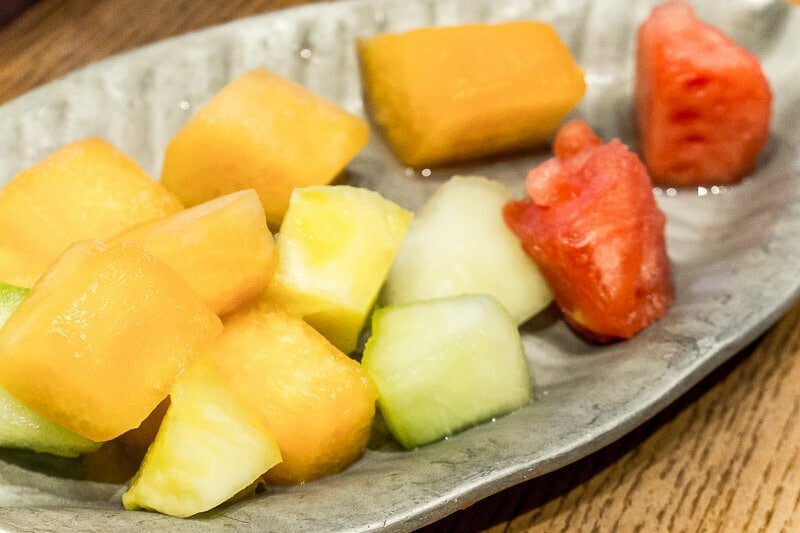 It also comes with your choice of juice, and the passion fruit guava blend juice (can’t remember what it is) was delicious! Another fun bonus is that the scenery changes as you rotate by, so there’s never a dull moment in Garden Grill! Lunch and dinner menus are also served family style with more of a homestyle Thanksgiving dinner feel including salad, turkey, mashed potatoes, etc. Here’s the full menu. Up until my most recent visit to Walt Disney World, I had no reason to try out the princess breakfast. My son wanted nothing to do with princesses! But this time, we had my niece with me, so we decided to give it a shot. 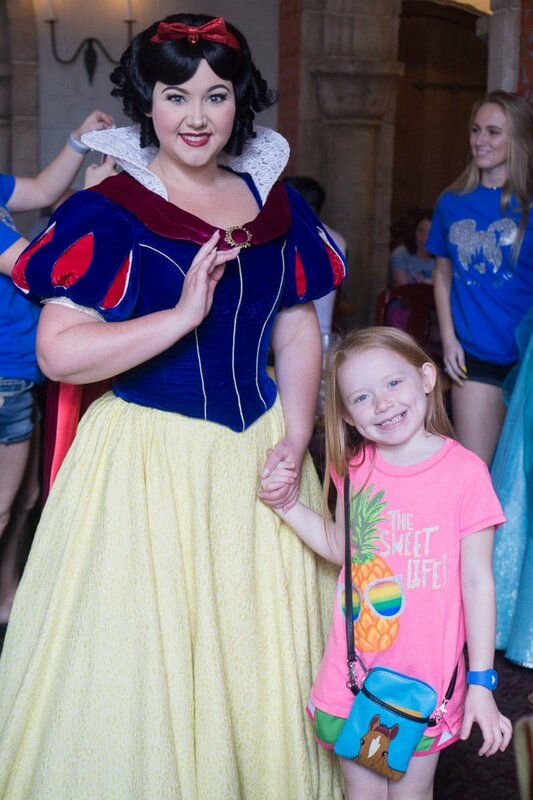 I would probably skip the lunch or dinner with young kids because the menu is a little strange, but I absolutely loved the princess breakfast! You can see the full lunch/dinner menu here. 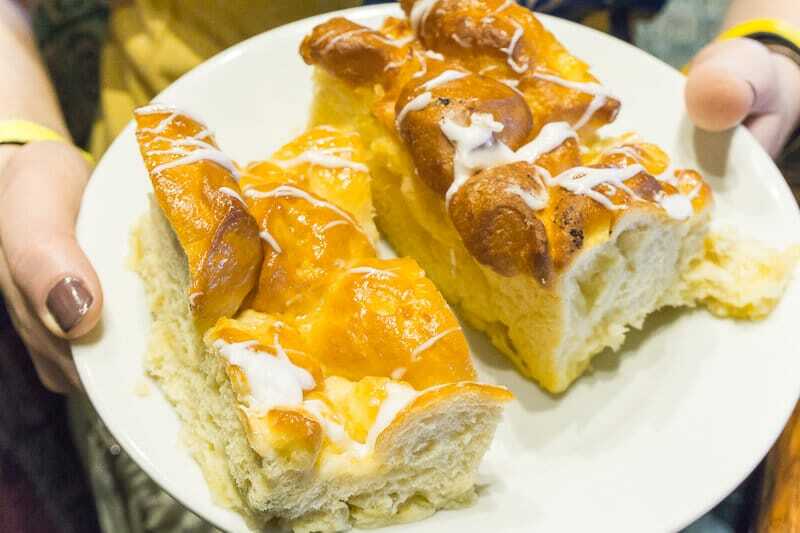 The breakfast comes with both a buffet option that includes fresh fruit, pastries, yogurt, etc. 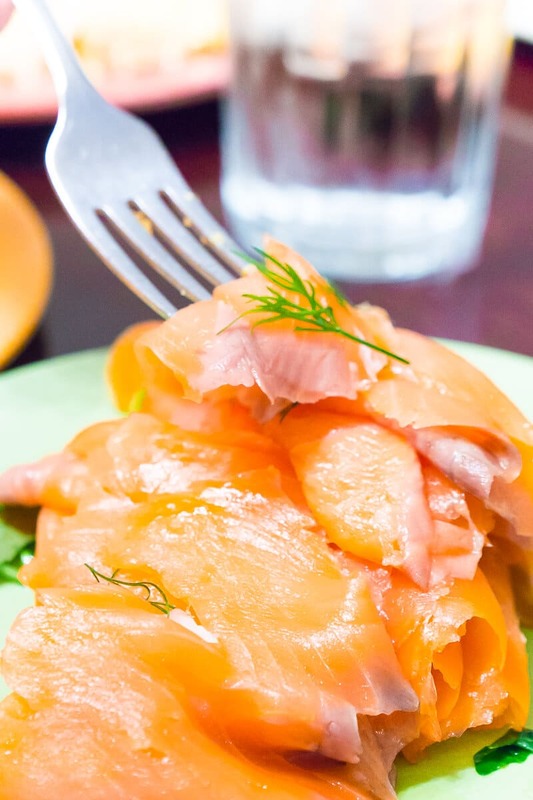 as well as hot food that is brought to your table family-style. While the food wasn’t amazing, there was enough variety that everyone found something to eat. 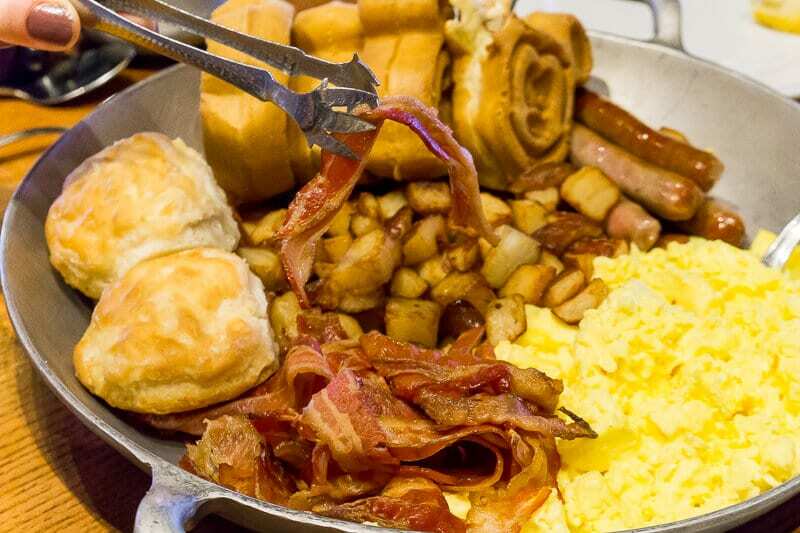 The hot food brought to your table includes eggs, hash brown cakes, sausage, and bacon. 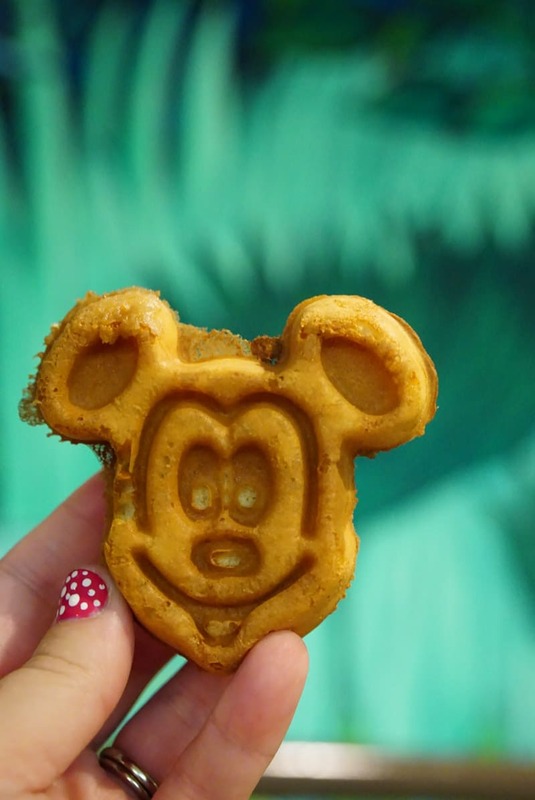 And rumor has it that if you ask, you can get Mickey waffles though it’s not advertised. The best thing about this breakfast is that you get to see at least five princesses. We met Belle and took photos with her at the front of the restaurant and then the other princesses stopped by our table throughout our breakfast. All the princesses acted just like princesses should, and my niece was enamored. If you have a princess loving girl, get a breakfast reservation here and skip waiting in all of the other lines in the parks! There are a ton of other Disney character dining options available and as promised, here are reviews of all of the remaining character dining meal options at Walt Disney World! 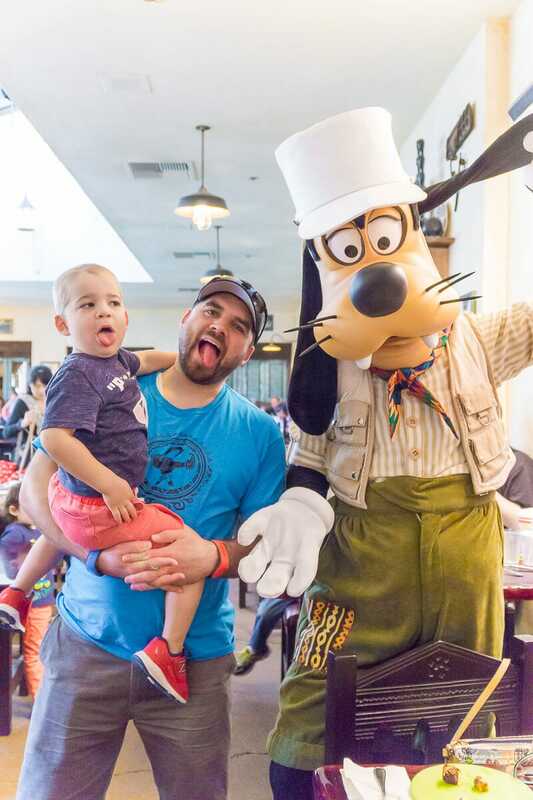 I’ll be the first to tell you, Disney character dining with toddlers can be amazing, and it can also be not so amazing. 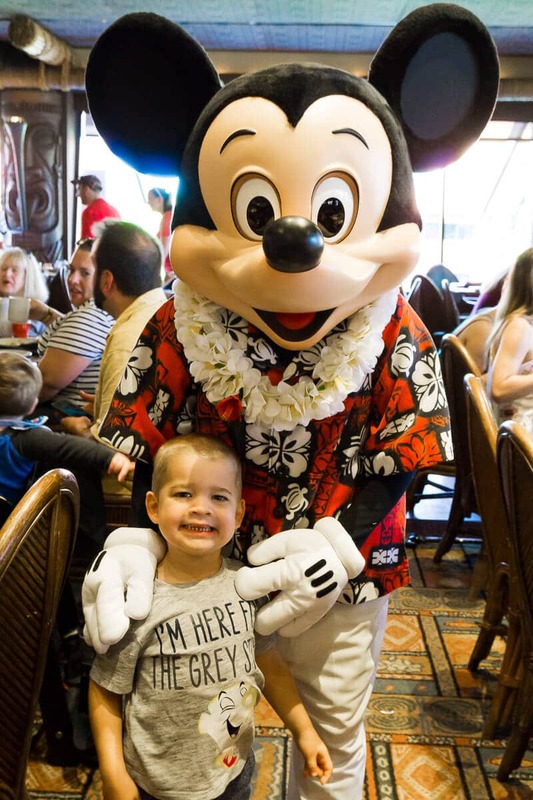 If you’re planning a Disney character meal on your next visit and are planning to take a toddler or preschooler, this Disney character dining guide will be your new best friend. Let the kids pick who they want to meet and which Disney character dining to do. Get your toddler involved in the planning process. If they can choose who they want to meet, it’s more likely that they’ll actually want to meet them when the time comes. Or not, because let’s be real, they’re toddlers. If you can only get a reservation to a certain place, embrace the screen time and get your child familiar with those characters before the big day. Don’t let YOUR expectations ruin the Disney character dining experience. This was a big one for me. 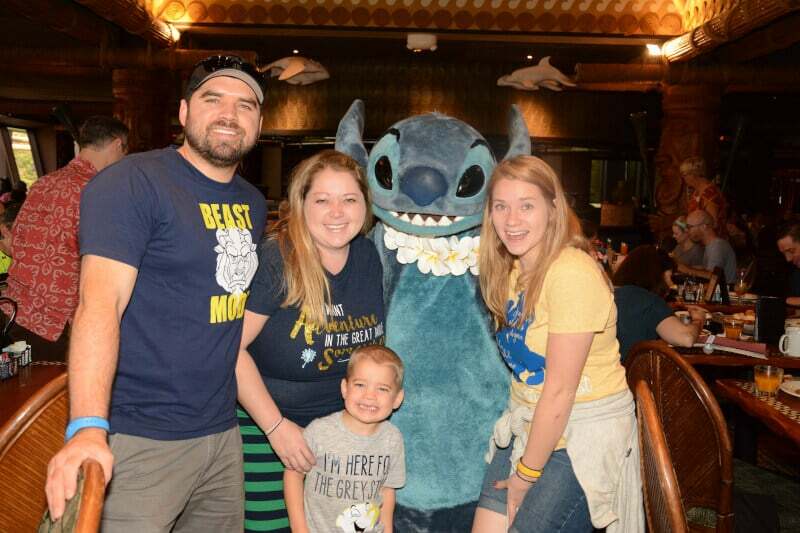 On our first meal, we paid a crazy amount to have a character dining experience, not just eat, and my son wanted nothing to do with the characters. Nothing. I pushed, prodded, and even tried to hold him up to the characters, and he was having none of it. He was perfectly content to sit back and watch while my sister and I took pictures with them. Know that you’re dealing with a toddler and honestly characters can be a bit overwhelming or maybe your toddler is just having a bad day. Don’t force it, just let them do their own thing and enjoy it in their own way. Watching from afar may be the highlight of their year, even if you really wanted them in a picture hugging a character. If you know ahead of time that they’re scared to death of characters, maybe skip it this trip and try again on your next visit. I learned this the hard way as well. If there’s a continuous or multi-shot function on your camera, set it up before the characters even get close. Not sure about your toddler but when I tell mine to say cheese, he literally smiles and says cheese for a millisecond then moves on to something else. With older kids you can often get them to pose, with toddlers, not so much. If your camera is on continuous shot, you can start shooting before you say cheese (or right when the character comes near) and capture every moment instead of missing the one where they actually smiled. It also helps avoid the blurriness of your child moving (because they will) throughout the process. 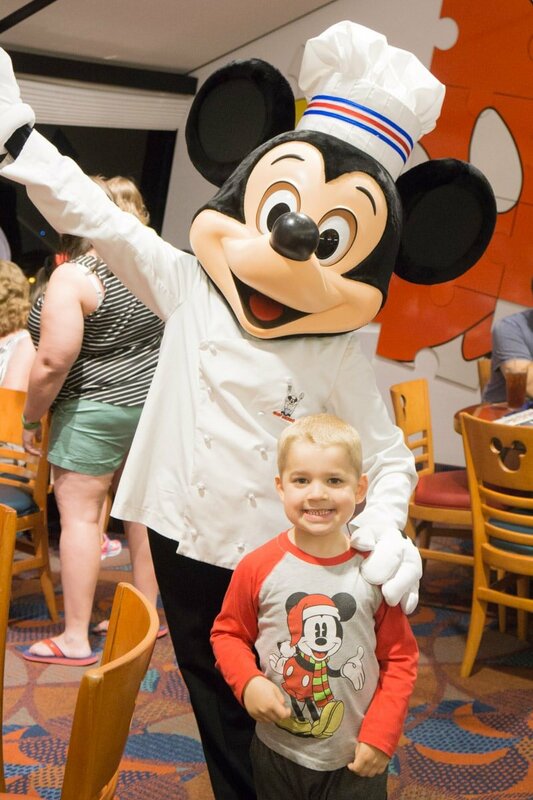 Some of the Disney World character dining opportunities have Disney Photo Pass photographers if you are using Memory Maker but if they don’t, you want your camera to be able to capture that smile and hug! 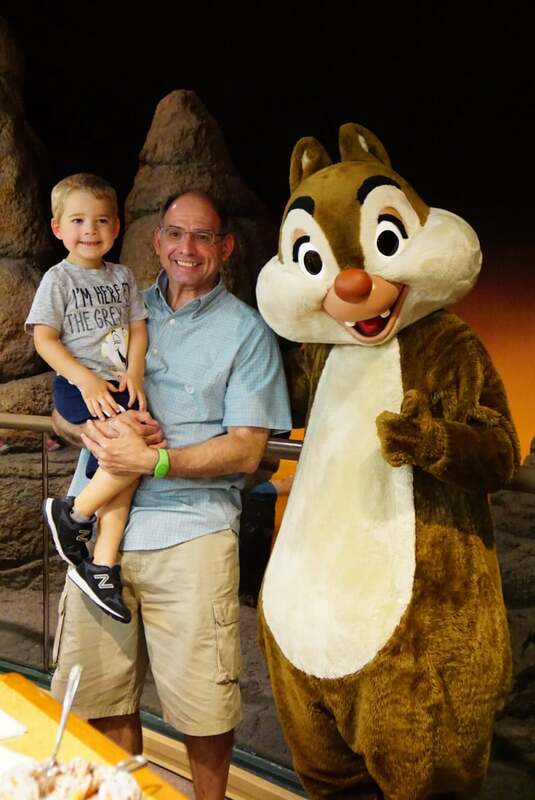 Disney World vacations require a lot of planning, but they also require a lot of flexibility, especially when visiting with toddlers. If you’re going to bed late the night before a character breakfast, check to see if you can push your reservation back a bit or even change it to another day if you have that much flexibility. We were able to do this with both our Hollywood & Vine and Tusker House breakfasts and even the extra half hour made a huge difference. Don’t wake everyone up too early or skip a nap just to do a character meal, or I can almost guarantee you’ll end up disappointed or frustrated. Toddlers need sleep, and lots of it. Check the Disney website again two days, one day, and the night before to try and snag a last-minute reservation someone cancelled. I know this seems like a strange one but stick with me here. On the morning we went to the Polynesian for our Ohana breakfast, we left our hotel room, hopped into the car, and were at the Polynesian checking in within 15 minutes. When you’re dealing with toddlers and trying to have the best Disney character dining experience ever, waiting on Disney transportation can be the start of your downfall. You might have an amazing experience where the busses are there, empty, and take you directly where you want to go – but most likely that won’t be the case. If you’re looking for the best Disney character dining with toddlers, it starts with driving yourself there. And it doesn’t hurt if you shut down the parks either. 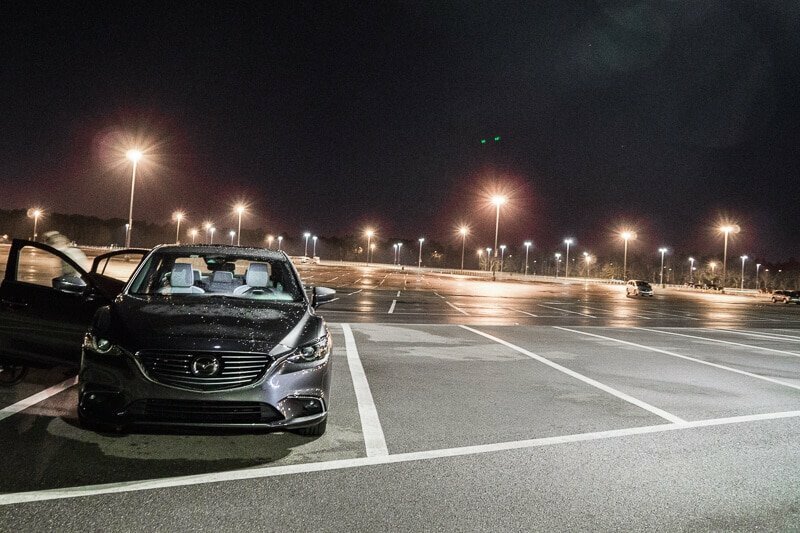 I’ve already written about why I think everyone should rent a car at Disney World, but it’s worth repeating, especially if you have toddlers. First and foremost, plan to go when your kids aren’t going to be exhausted. Character dining is not a quick thing, it’s an experience. If that’s first thing in the morning, great. If that’s for lunchtime once they’ve been on a few rides and are a little more awake, great. We’ve done both first thing in the morning, lunch, and dinner with my son and the best time for us was lunch because my son was awake, happy from all the rides, and a bit giddy because it was almost nap time (but not quite). 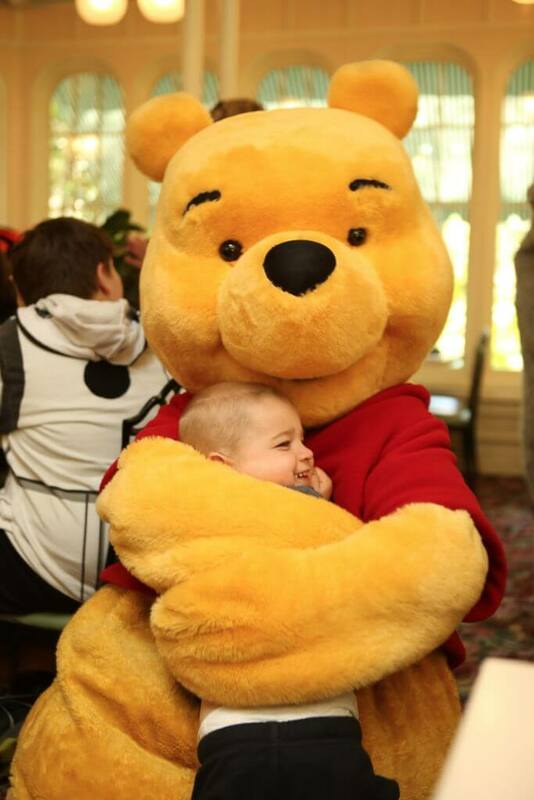 His interactions with the Winnie the Pooh characters at the Crystal Palace are some of our most magical moments at Disney World ever. I’ve found it’s normally hard to do a character breakfast first thing in the morning if you have kids who like rides because all they can think about are the rides! 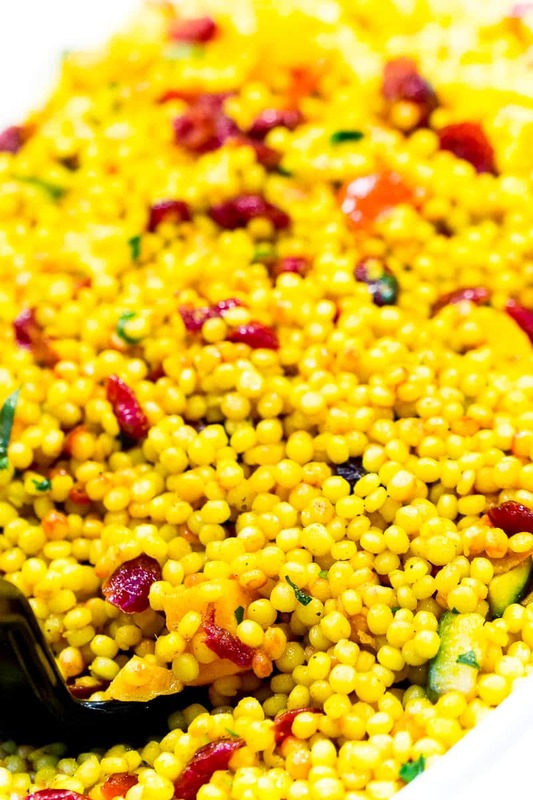 If you’re a foodie or just want to try different types of food, find out what time your restaurant of choice switches over from breakfast to lunch. They often switch one side over before the other, so you can actually get the best of both worlds. This is especially great at Hollywood and Vine because they only schedule reservations through a certain time for breakfast and then don’t start letting in other people for lunch until a bit later, which means there is a lull in people in the restaurant and less people = more character time. We were only at Hollywood & Vine for about an hour and saw all of the characters at least three times, and they interacted with us each time. It was amazing. One word of caution – I’d call and check with the restaurant to see if they have set break times for the characters. While we loved being able to try both the breakfast and lunch food at Tusker House, we were seated right before a character break time so we ended up having to wait to see any characters for quite a while. And waiting with toddlers is not fun. If you happen to have a child who says they don’t want to meet the characters, I recommend you taking pictures with the characters anyway. In fact, get the entire group other than that child up for the picture. 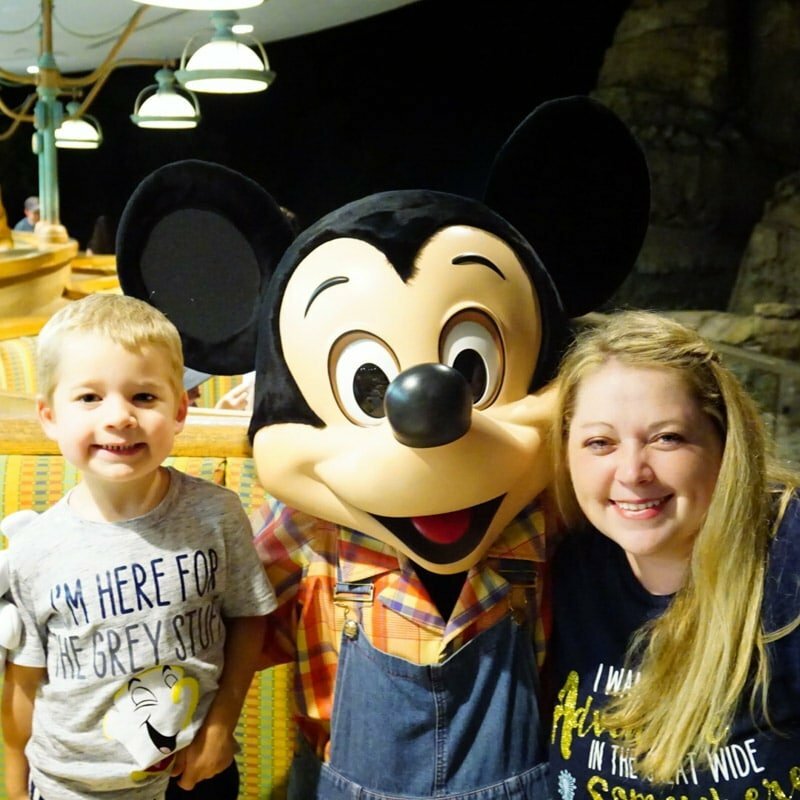 We had two instances where my son was adamant that he wanted nothing to do with the characters but as soon as he saw mom, dad, and Elle with Mickey Mouse, he scurried under the table to come join the fun. I think they just need to see that it’s safe, that it’s not scary, and that they’re missing out. Where did you get those great t-shirts? Hey April, I actually made them! You can find the cut files and more details here –> http://www.playpartyplan.com/diy-shirts-beauty-and-beast/. How much time do you allot for character meals? Trying to plan fast passes and don’t want them to interfere with each other! I would plan to be in the restaurant for 90 minutes, that’s how long they say it takes for the characters to get all the way around. If it’s somewhere like ohana or crystal palace that sometimes has a wait to get in, might want to buffer a little extra time! Can you go dine to the various resorts restaurants without being a guest. We are planning our 1st trip to DW this April and I have no idea what am I doing. I have a 2 year old and a 4 year old. We are going to Magic Kingdom and Animal Kingdom only 2 days. Yes! You can go to any of the resorts regardless of if you’re a guest or have tickets to the parks. If you want to do a meal in one of the parks, you do have to have tickets for that particular park (or a park hopper for multi-parks).